On Thursday the European Commission expanded its antitrust charges against Google (GOOG) in the areas of search and advertising. The charges claim that Google has violated EU antitrust regulations and the competition commissioner wants the practice to change. The European Commission argues that in Europe Google is abusing its dominant position in the online search market to benefit its own advertising business. It claims that this can hurt consumer choice. “Google has come up with many innovative products that have made a difference to our lives. But that doesn’t give Google the right to deny other companies the chance to compete and innovate. Today, we have further strengthened our case that Google has unduly favored its own comparison shopping service in its general search results pages,” competition commissioner Margrethe Vestager said. She also raised concerns that Google has hindered competition by limiting the ability of its competitors to place search advertisements on third party websites, which negatively impacts innovation. Adsense is the service that Google uses for its third party advertising. If customers use its sponsored search bar then both Google and its retail partner would earn commission. But it systematically favors Google’s own services. This means the search results that internet users see may not be the most relevant to what they’re looking for, but it’s what benefits Google the most, restricting competition. The other new charge revolves around Google’s Android operating system. Android phones have Google apps and search software pre-installed on them. This is a deal made between Google and phone manufactures before consumers even buy the phone. The EU says this isn’t fair to consumers because they should be able to have a choice in the apps they use. In response to the charges Google has released a statement saying that they’re looking over the cases carefully. Google spokesman Mark Jansen wrote in an email, “We believe that our innovations and product improvements have increased choice for European consumers and promote competition. We’ll examine the Commission’s renewed cases and provide a detailed response in the coming weeks.” Google and parent company, Alphabet, have eight weeks to respond to the supplementary statement of objections and ten weeks to respond to the statement of objections regarding AdSense. 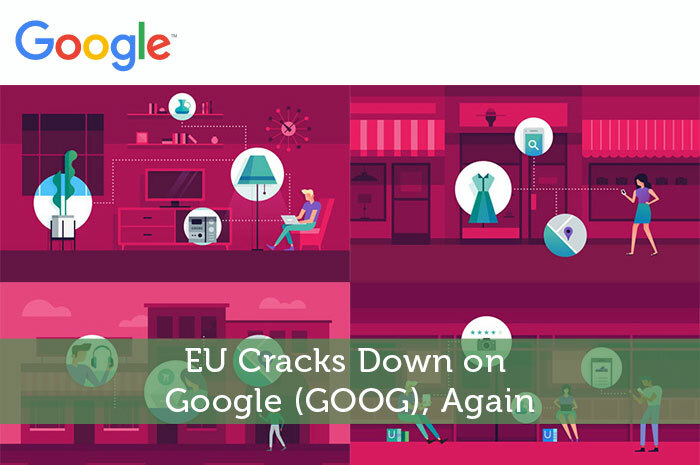 Google is also actively investing in lobbying efforts to help win some favor in the EU. Google had spent about $4.5 million in 2014 to try and influence EU policies. If Google is to found to have violated any of these antitrust laws it would face up to 10% of its global revenue, which is about $7.5 billion. However, investors have managed to shrug off this risk for the most part. The stock price has been largely unchanged this past week. Analysts continue to give an Outperform rating on Alphabet (GOOG.) Stephen Ju from Credit Suisse has a $920 price target for the company, which suggests 28% upside from the current price. This isn’t the first time the EU Competition Commission has targeted the technology giant. The first investigation came in 2010 and many different allegations have been thrown at Google since. Last month Spanish tax inspectors raided the offices of Google’s Spanish headquarters in Madrid, Spain. The raid was authorized by Madrid court and involved more than thirty officials and investigators. This was one of many high-profile tax investigations launched in Europe. Many of them targeted Google’s policy to redirect most of its European earnings through Ireland, which is a low tax jurisdiction. By doing this Google can limit its tax liabilities in other European markets where it does business. Needless to say the European Commission has caused a lot of headache for Google. As technology and internet usage become even more widespread in the future, dealing with increased regulation will just have to become an expected cost to doing businesses. This author is long 6 shares of GOOG as of writing this post.